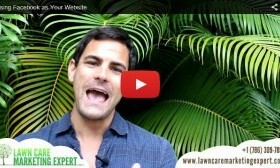 The January 2013 Lawn & Landscape Cover Story Features Lawn Care Marketing Expert discussing Phone 101: How to use the phone to win customers and keep them coming back. In business, it is often those things we don’t give much thought that with just the right tweaks can really have an impact on our profits and growth. Having a clear well defined phone strategy is one of those often overlooked things. I work with lawn care and landscaping companies big and small below 100k to over 8m. When it comes to the phone, shockingly the biggest difference between the two is that the larger companies have several people on staff to answer the phones. But when it comes to how the phones are actually used the differences end. Harlan Hogan’s famous quote “You never get a second chance to make a first impression” is still true today. Unfortunately, many companies treat it as a cliché and have no strategy behind their phone. If you can talk, you generally have all the skills you need to be a lawn company’s first impression. They forget that as far as a prospect or client is concerned – the person answering the phone IS YOUR COMPANY. Just as the skill of your crews determines the quality of your company’s work, so to does the way your staff handle the phone give your company its image. But this topic is deeper than just being polite. This is about growing your business. And your phone staff has a direct line on helping or hindering that growth. That’s why you’ve got to provide your staff with the tools they need to be successful on the phone. If you don’t have a real live human answering the phone that signals to the prospect that they would have trouble reaching you if they were a client, your quality is average or worse and that you are either too small or too busy to handle a new customer. If money is tight, consider hiring a part-time person to cover peak call hours; in addition, after the third ring use a live receptionist answering service for fall over and all after-hours calls. Return all calls immediately or if it the call was left overnight first thing in the morning. The quicker your response the more likely you are to win the contract and reinforce a proactive image of your business. Start logging all phone calls. Yes, I can hear your collective groans, but this is easily done with a pen and pad, excel spreadsheet or professional lawn management software such as Service Autopilot. The log should contain: date and time of call, full name, mobile phone number, email address, address, lead source, action and outcome. Once you start to collect this data you will begin to see trends: what times of day you get the most calls, common questions, service problems and objections. And most importantly, lead information. Where are new leads coming from? The Internet? Direct Mail? Referrals? If you don’t ask you don’t know. And if you don’t know then you might very well be wasting money on ineffective marketing. From your call logs, you will see leads that call but don’t end up signing up. Many times this is due to price, but not always. Your staff should be trained to counter any objections a new lead may have to using your service “You’re too expensive”, “I don’t want to have my lawn mowed every week”, “I want to pay by check” – Noting these objections can help you identify areas in your business that may need to change. For instance, if you’re constantly getting requests for pest control services, it might be time to offer it. The other piece of data that is going to stand out in the logs, are questions. Develop a list of frequently asked questions and their answers. This should be a constantly updated document and the staff should be responsible for updating it regularly. There is nothing they should not have an answer to. Doing this will also eliminate the need to put callers on hold while they find an answer. Encourage employees to help refine this process, note new objections, update the frequently asked questions and create an even smoother process over time. Place a current copy of the tools in a binder by all phones that accept incoming calls. Many residential LCOs are estimating and closing sales right over the phone. This requires a very specific process, and the staff must be fully trained on how to do it accurately. However, most prospective clients will require an onsite estimate and cannot be closed over the phone. That’s fine; just don’t let the prospect off the phone before they have committed to something. Schedule an appointment to meet for the estimate, a free lawn health audit, or even a set time to call them back after the property has been looked at to discuss your findings. Getting them to commit to something will usually keep them from continuing their search with your competitors until they hear back from you. Most companies just email an estimate or leave it on the door with no follow up. Don’t do this. Always call. Always follow up. If they didn’t choose your company find out why and make adjustments, put them in your email and direct mail marketing list and send them a second chance offer and future promotional offers. Slow periods should be used to call and check in on existing clients. Have they been happy with your service? If not, you can preempt any future business loss by resolving their issues. If they are happy with your service, now is the time to upsell – always tell them about a new service, seasonal or limited time offer and discount. Offer a bounty to those on your team that sell more services. They don’t have to be pushy about it, but injecting it into the conversation with finesse will take some practice. Reaching out to your existing clients from time to time shows them that you really care about having their business. Putting these simple guidelines in place will take some thought and a little effort, but the rewards in customer satisfaction, new clients and increased revenue make it well worth it. What would be a good way to find leads to cold call? Cold calling is not a strategy we recommend. Some lawn treatment companies do still employ the strategy but it’s days are numbered.